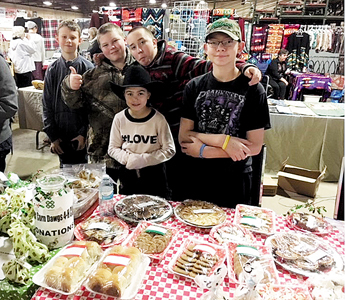 A 4-H canine club started in Nov. 2017 called the Taber 4-H Corn Dawgs. There are currently 19 members in the club which will be training their dogs at least once a month. Currently we’ve been meeting at the Taber Agri-Plex. We will have to keep track of the dogs’ food scheduling and are required to work with our dog daily. There are many different types of dogs in the club, all over one-year old. At our last training, we played a game where you had your dog in one hand, a cup of water in the other, and we had to go from one side to another. We also worked with our dogs on socializing with strangers. So far, we have sold dog treats at the Christmas market and raised $480. We have also had a Christmas Potluck meal and a Chinese gift exchange. We will also be having our speak-offs in February. Our last meeting was on Jan. 2 and following the meeting, we trained the dogs.